Charming 1920's lake Home on 270 acre Ox lake with no public access. Great fishing! 28 foot water clarity and 72 feet deep. With a canoe you can portage over beaver dam to Little Ox Lake. Second dock on Loon Lake across road has boat lift that will fit boats to 18 ft.
Loon lake is on the Whitefish chain which is 14 connected lakes covering 14,000 acre's. Home is on 2 acre lot with 220' frontage on Ox lake. Lot is 500 ft. deep and very quite. Many mature pine tree's. Great view of island from Home. Neighboring cabins both over 100' away. Home is over 2400 finished sq. ft, Newly remodeled including new kitchen, baths, and lower level walk-out game room with bar. Beautiful natural woodwork and hardwood floors, deck overlooking lake, living room with fireplace, dining room, sunroom, 3 bedrooms, and large kitchen. Kitchen has new appliances including dishwasher, laundry on lower level, porch, and garage. 64 years old. Own and manage residential income properties in St. Paul, MN. I started coming up to the Crosslake area in the early 1960's when I attended a summer camp on Trout Lake and have been visiting ever since. I purchased the home on Ox Lake in 2002 because of the setting of the property and its access to the two lake areas. The most enjoyable benefit has to be the view of the island. The beautiful tree's and the quite location are hard to beat. Ox Lake is a very clear lake and with no public access and its not to busy and the fishing is great. Having access to the Whitefish chain offers many additional boating possibilities and access to Restaurants from the water. 2 Canoes,fishing boat,2 kayaks,2 paddle boards on Ox lake included. (2) Cable tv, Flat screen 42' in living rm, 46' flat sceen in basement rec rm. Dvd player in lr and rec room. Vcr player in lr. 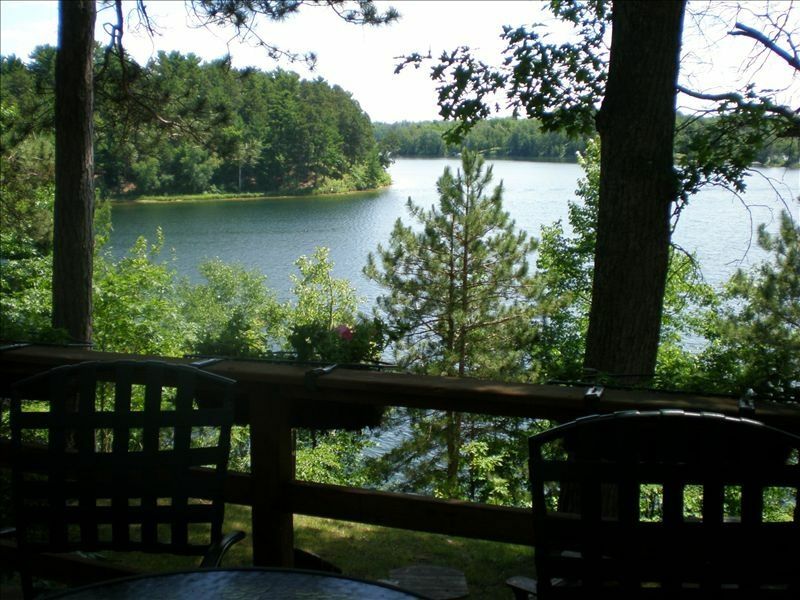 Cabin and property provides many nice places to relax and enjoy quiet time or table activities. Lake is very quiet and great for fishing, kayak, swimming. Raft offshore was a favorite place to hang out. Cabin is older but in great shape and has a lot of charm. Single bathroom on the main floor should be considered if thinking about larger groups. Would return to this property without concern. This is a lovely old lake home with some modern updates. It has a lovely calm feel to the house. Our group of 9 really enjoyed themselves. We loved eating on the deck and taking in the beautiful view. We were lucky that the weather was very moderate (low 80's) and that it cooled off nicely at night. The many ceiling fans kept the temperature very comfortable. On the not so lucky side, there was a huge hatch of mosquitos --the grocery store was sold out of bug spray! We managed pretty well and all brought home numerous bites. This is just Mother Nature and not anything that could be controlled. We also enjoyed using the kayaks, Stand up paddle board and canoes. Our kids are all adults but that doesn't mean they don't like extra water toys! The raft off shore was also enjoyed and utilized. A wonderful family week at the lake. We had a weeks vacation in July and could not have chosen a more perfect place. This cabin has so much character... we were pleasantly surprised!! The large windows, ceiling fans and comfy furniture made it so liveable. There are so many great spots to read a book, have a cup of coffee, or just look at the towering pines. We prepared a lot of meals and the kitchen was very well stocked. We used the canoe and went out and explored the island, listened to loons calling daily, had campfires and grilled on the two Webers. We have friends on the Whitefish chain who came to visit and they were in AWE of the views! We would come back in a minute!!! Our family loved this cabin for a cozy northwoods get-away! It was clean, spacious, well-stocked and our kids especially loved the walk-out level rec area. Great cross-country skiing nearby, and walking on the lake ice was fun as well. The cabin is close to the town of Crosslake, so getting groceries, going out to eat, and other activities are only minutes away. Kent was easy to work with, offering suggestions of good hiking and skiing areas nearby. I would highly recommend this property for anytime of the year. We'd love to come back in the summer!